A celebrated traveler of the twelfth century. Beyond his journey, no facts of his life are known. In the preface to his itinerary, entitled "Massa'ot shel Rabbi Binyamin" (Travels of Rabbi Benjamin), the information is furnished that he came from Tudela in Navarre, and that his father's name was Jonah. This descriptive work, written in an easy, fluent Hebrew, is compiled, as the preface states, from notes made by the traveler on the spot and brought back by him in 1173 to Castile. The unknown author of the preface probably compiled the account for Benjamin from these notes, retaining the traveler's own words in the first person, but omitting much. Benjamin, for instance, claims to have noted down everything that he saw and all that he heard from the mouths of men of established reputation in Spain. His notes, therefore, may have contained at the same time the names of his informants; but in the book as published only Abraham the Pious is mentioned by name as having given information in Jerusalem. Benjamin, who probably traveled as a merchant, evinced keen interest in all things, and possessed a clear insight into the conditions and history of the countries he traversed. His journey occupied thirteen years: setting out from Saragossa in 1160, he was back again in Spain in 1173. He made long stays everywhere, taking plenty of time to collect his information and to verify or disprove accounts given him. Being an intelligent Spanish Jew, he took an appreciative interest not only in Jewish affairs in the lands he visited, but also in the general conditions prevailing and in the various historical and educational facts related to him. His account contains numerous valuable details of the political history and internal development of countries and nations; and the history of commerce must always count Benjamin's itinerary as one of its earliest and most valued sources. The commercial importance of Barcelona and Montpellier, of Constantinople and Alexandria, as centers of international trade is vividly depicted. The situation of some cities—as, for instance, Amalfi—is described in terse but graphic words. He gives a clear picture of the peculiarities of the republics of Genoa and Pisa, in which every house was a fortress. His characterization of the Greeks is accurate: waging war by means of mercenaries, he says, they had come to have no warlike spirit themselves and had become women. He is struck by the significance of the victorious progress in Europe of the Seljuks, whom he calls Turks. He treats of the Assassins and Druses with great shrewdness, as well as of the Wallachians, who were invading Greece by way of the Balkan passes. He made the intimate acquaintance of the most important functionaries of the Byzantine empire, and has much to say likewise about the calif in Bagdad, whom he compares to the Christian pope. Many more of these little details of information could be adduced to show Benjamin's acuteness of observation and critical understanding of affairs, both Jewish and non-Jewish. 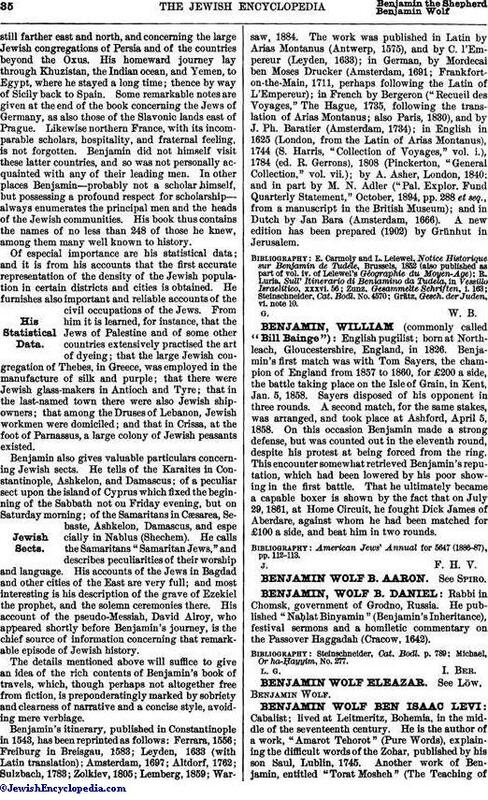 But Benjamin's chief interest undoubtedly centered in the conditions of the Jewish congregations of the countries he visited, and about which he has registered so many and such important and reliable accounts that his "Travels" are considered a source of the first importance for the history of the Jews in the twelfth century. With the sole exception of the "Sefer ha-Ḳabbalah," written about the same time by Abraham ibn Daud of Toledo, there is no work which compares with Benjamin's in value. His accounts, moreover, cover the majority of the countries then inhabited by Jews. In a species of panoramic view, he gives full descriptions of the Jews living in all those lands, with accurate data about them, their civil standing, their occupations, their schools, and their leading men. Benjamin's route to the East took him through Catalonia, southern France, Italy, Greece, the islands of the Levant, Syria, Palestine, and Mesopotamia, to Bagdad. Arrived at that city, which was then again the residence of a Jewish exilarch, he gathered information concerning countries which laystill farther east and north, and concerning the large Jewish congregations of Persia and of the countries beyond the Oxus. His homeward journey lay through Khuzistan, the Indian ocean, and Yemen, to Egypt, where he stayed a long time; thence by way of Sicily back to Spain. Some remarkable notes are given at the end of the book concerning the Jews of Germany, as also those of the Slavonic lands east of Prague. Likewise northern France, with its incomparable scholars, hospitality, and fraternal feeling, is not forgotten. Benjamin did not himself visit these latter countries, and so was not personally acquainted with any of their leading men. In other places Benjamin—probably not a scholar himself, but possessing a profound respect for scholarship—always enumerates the principal men and the heads of the Jewish communities. His book thus contains the names of no less than 248 of those he knew, among them many well known to history. Of especial importance are his statistical data; and it is from his accounts that the first accurate representation of the density of the Jewish population in certain districts and cities is obtained. He furnishes also important and reliable accounts of the civil occupations of the Jews. From him it is learned, for instance, that the Jews of Palestine and of some other countries extensively practised the art of dyeing; that the large Jewish congregation of Thebes, in Greece, was employed in the manufacture of silk and purple; that there were Jewish glass-makers in Antioch and Tyre; that in the last-named town there were also Jewish shipowners; that among the Druses of Lebanon, Jewish workmen were domiciled; and that in Crissa, at the foot of Parnassus, a large colony of Jewish peasants existed. Benjamin also gives valuable particulars concerning Jewish sects. He tells of the Karaites in Constantinople, Ashkelon, and Damascus; of a peculiar sect upon the island of Cyprus which fixed the beginning of the Sabbath not on Friday evening, but on Saturday morning; of the Samaritans in Cæsarea, Sebaste, Ashkelon, Damascus, and espe cially in Nablus (Shechem). He calls the Samaritans "Samaritan Jews," and describes peculiarities of their worship and language. His accounts of the Jews in Bagdad and other cities of the East are very full; and most interesting is his description of the grave of Ezekiel the prophet, and the solemn ceremonies there. His account of the pseudo-Messiah, David Alroy, who appeared shortly before Benjamin's journey, is the chief source of information concerning that remarkable episode of Jewish history. 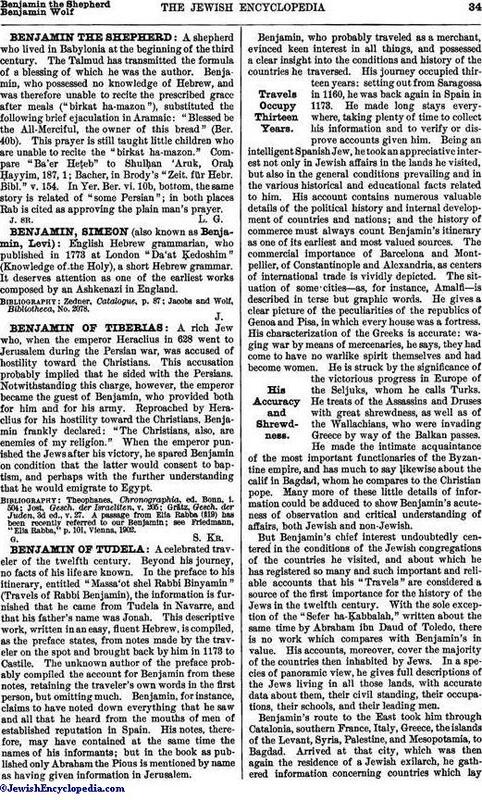 The details mentioned above will suffice to give an idea of the rich contents of Benjamin's book of travels, which, though perhaps not altogether free from fiction, is preponderatingly marked by sobriety and clearness of narrative and a concise style, avoiding mere verbiage. Benjamin's itinerary, published in Constantinople in 1543, has been reprinted as follows: Ferrara, 1556; Freiburg in Breisgau, 1583; Leyden, 1633 (with Latin translation); Amsterdam, 1697; Altdorf, 1762; Sulzbach, 1783; Zolkiev, 1805; Lemberg, 1859; Warsaw, 1884. The work was published in Latin by Arias Montanus (Antwerp, 1575), and by C. l'Empereur (Leyden, 1633); in German, by Mordecai ben Moses Drucker (Amsterdam, 1691; Frankfort-on-the-Main, 1711, perhaps following the Latin of L'Empereur); in French by Bergeron ("Recueil des Voyages," The Hague, 1735, following the translation of Arias Montanus; also Paris, 1830), and by J. Ph. Baratier (Amsterdam, 1734); in English in 1625 (London, from the Latin of Arias Montanus), 1744 (S. Harris, "Collection of Voyages," vol. i. ), 1784 (ed. R. Gerrons), 1808 (Pinckerton, "General Collection," vol. vii. ); by A. Asher, London, 1840; and in part by M. N. Adler ("Pal. Explor. Fund Quarterly Statement," October, 1894, pp. 288 et seq., from a manuscript in the British Museum); and in Dutch by Jan Bara (Amsterdam, 1666). A new edition has been prepared (1902) by Grünhut in Jerusalem. Grätz, Gesch. der Juden, vi. note 10.